I stayed away from Elfquest back in the day because my buddy liked it so much (I know...I'm a jerk), but recently Eric Shea got me to read and even review a few issues and I finally got to see what the fuss was about. I wish I hadn't been so stubborn! Thanks so much for the comment, Jim. I think we can all be stubborn about certain hyped series... I haven't been able to get into the Walking Dead or Saga due to the incessant hype (I know... I'm a jerk too, heh). 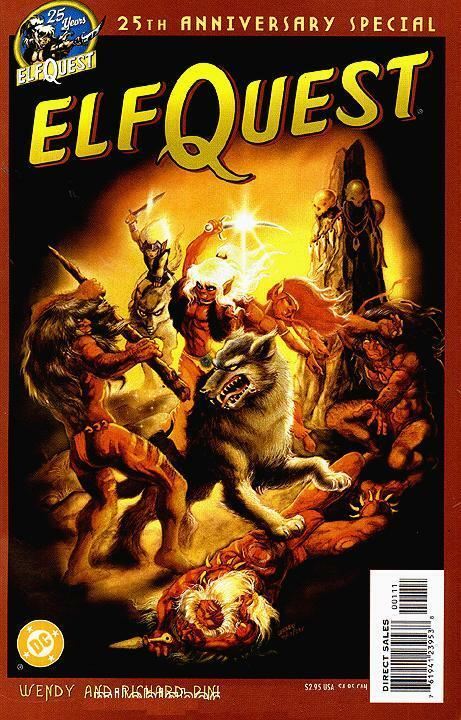 ElfQuest is a great series, I'm glad you're enjoying it as well. Your opinion is one I value rather highly online, I'm glad we are on the same page! Thanks for a wonderful reminiscence! It's been a long time since we took those first steps, and we're glad to see it all again through different eyes. It is a true honor to have you swing by and check out my (hopefully not too gushy) celebration of your and Wendy's wonderful creation. It was and is such an important part of my life, speaking "comics" and otherwise. You were the first creator I reached out to when my family got the internet in the ye old 1990's. I was a foolish teenager (surrounded by other foolish teenagers) and I bent your ear repeatedly for hints and tips for starting up my own comics publishing company. You were gracious then, as you are now.